Villa UJV 123, also known as Lagon Bleu, is a luxury 5 bedroom villa, located on the exclusive hillside of Petit Cul de Sac, in the "Domaine du Levant" gated community. Spacious, with open plan, and beautiful views of the ocean and bay. Villa UJV 123 is very well designed and nicely decorated and has unique ceiling lights that you can set to constantly change colors. The bedrooms all have sea views and private terraces. The pool is adjacent to the living room and clients have access to the beach and use of the Domaine du Levant tennis courts. 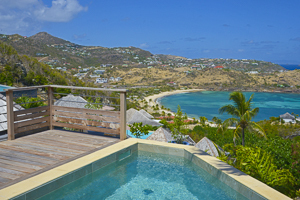 Guests of Villa UJV 123 will have complimentary access to Form Fitness, the best sport center in St Barts.